Children are sure to enjoy it, and learn from it, over many years. If you look very closely, you will find enchanting small stories on every page. Lots of fun to browse through and spot the little stories happening on each page. Perfect for children who are just starting to talk. 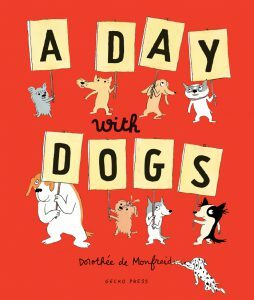 This book has it all… Reminiscent of Richard Scarry’s books, this is perfect for the point-and-say club, but it will also help older children make connections about objects they see every day. If there is one book to add to your child’s picture book collection this year, make it this one. This book has it all. No, really, pretty much all. The oversize board-book format, with thick, sturdy white pages, is home to a charming array of objects organized in various ways … Reminiscent of Richard Scarry’s books, this is perfect for the point-and-say club, but it will also help older children make connections about objects they see every day. This oversize board book executes its premise with far more panache and sly humor than most typical word books… Youngsters will enjoy all there is to see in this book, and it’s ideal for encouraging vocabulary building. 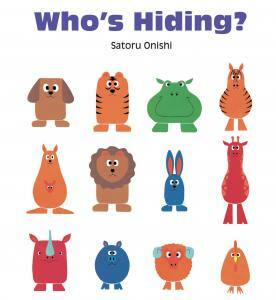 Parents and children will enjoy exploring the detail in this large-sized board book. Each page is an adventure full of delight and discovery…There’s so much to see and enjoy. Colours, shapes, household objects, animals, fish, transport, games fruit and vegetables, musical instruments, the alphabet and counting. 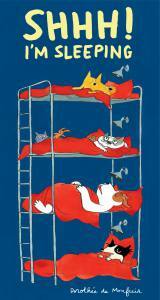 Many hours of pleasure can be shared with this attractive and sturdy picture book. With plenty to entertain the curious eye, the book captures, page by page, the spectrum of subjects that make up a young child’s day – various rooms of the house, seasons, animals presented according to habitat. […] This is the rare wordbook that can actually spur ideas and conversation and the spontaneous telling of stories. […] Not since Richard Scarry has an illustrator taken such obvious care to imbue a basic vocabulary primer with so much humor and relevance. For preschoolers, The Big Book of Words and Pictures rounds up all that really matters, from the time they get up in the morning to when they venture out into the world. An excellent first lexicon. It’s just what it says it is – a big book packed with cartoon-style illustrations and words against a predominantly white background. The added plus is that many of these illustrations are themed and interconnected, so every page contains a number of sequences or stories just waiting to be found – a whimsical way to add context and expand understanding. Sure to become well-loved and worn. For sure we will be gleefully recommending this title to all those buying for their babies and toddlers. It’s just what it says it is – a big book packed with cartoon-style illustrations and words against a predominantly white background. The added plus is that many of these illustrations are themed and interconnected, so every page contains a number of sequences of stories just waiting to be found – a whimsical way to add context and expand understanding. Like a modern Richard Scary, German illustrator K”nnecke populates his world with dressed-up animals going about human business. Look out for the white-flare-sporting Elvis elephant, the yoga-posing mouse and the piglet being shot out of a cannon. 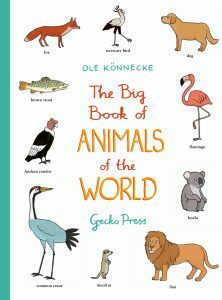 Wide awake children will love Ole K”nnecke’s Big Book of Words and Pictures. It is, as it says, a large board book full of thematic pages of early vocabulary, humorously illustrated. The book is sturdy, the colours are attractive and the vocabulary is extensive. I particularly like the alphabet sequence with its circus theme. Much thought has clearly gone in to making this a distinctive book of its type. Children are sure to enjoy it, and learn from it, over many years. 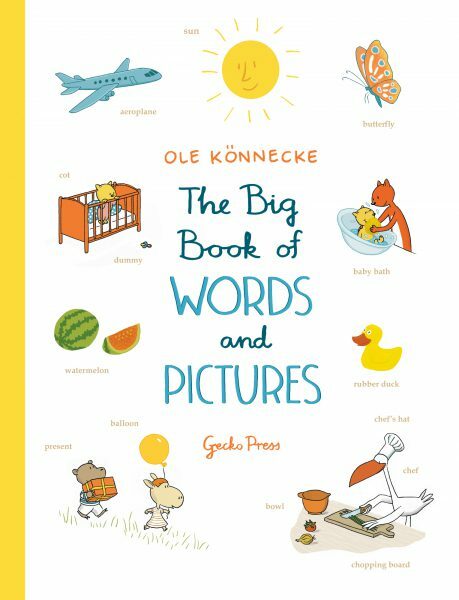 For littlies learning their ABCs there’s The Big Book of Words and Pictures by Ole Konnecke. A hugely enjoyable and imagination-expanding book which will enable young children to talk about all the things in their world and their feelings about them. This large format board book introduces a range of words that interest young people, along with amusing illustrations of animal parents and children demonstrating the meaning of the words. Thus two children eating biscuits drop crumbs which are sucked up by a vacuum cleaner. Words linked to clothes, homes, seasons, work, food, animals, and activities are neatly assembled on the large pages with witty drawings. There are even small jokes for parents. A sequence of pictures of wheeled transport recapitulates the ages of man (or, in this case, stork) as pram, pushchair, running bike, scooter, bicycle, motorcycle, car, walking stick, walker and wheelchair. The best sections come at the end: the counting page which is set in a children’s playground, and the alphabet double-page spread which constitutes a complete circus. This is an excellent book for young would-be readers to chew on. Look very carefully on every page and you will find there is a story told – encourage older children to retell the story using the clues in the pictures – a great way to encourage creative thinking and writing. A fascinating book with many levels of interest.